Wash all resin parts in lukewarm water with a strong detergent. This will remove any leftover oils from the molding and casting processes. Thin plastic glues do not work on resin, although the thick Testor’s brand of tube cement will form a loose bond. Superglue (cyanoacrylics or ACC) work well, but will grab instantly, if not sooner. Styrene sheet has two sides, one glossier than the other. Generally I want the glossier side on the outside. Fine details such as rims for portholes protrude on the glossy side. Parts are cut with a left and right hand, and front and back, orientation. The less glossy side may accept paint better. Sand the edges of all sheet styrene parts to clean off any flash. Sanding is also the best way to clean up the tabs on railings and stairways. These photos should be useful in locating details around the ship. For the ATSF versions, trim away the lower rub strip from the bow to the first vertical rib on both sides. Leave it for the PRR version. The curve of the stern can be build up with 6 mm wide strips of styrene (included). Use super-glue for the first strip, then thin plastic glue for inner strips. Once dry, sand a reverse contour into the stern as shown. 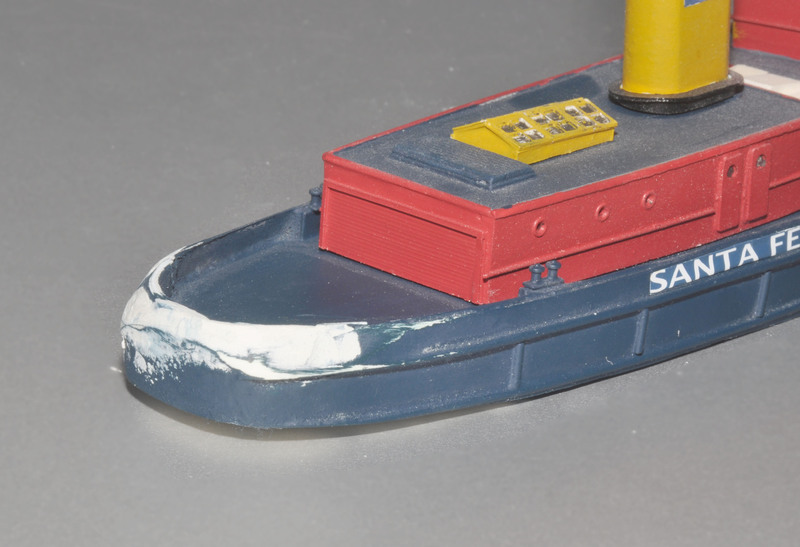 For the ATSF versions, use a razor saw to cut a small opening on the port bow for the anchor. Just cut down through the bulwark in two places and break the piece away. 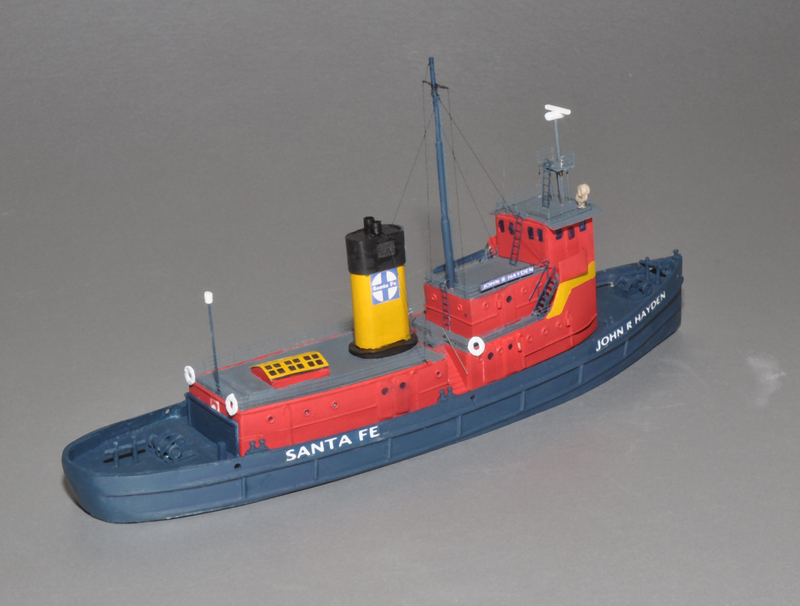 I believe the ATSF did away with most of the anchor chutes and mechanisms of the Army tug, and just hoisted a small anchor onto the deck with the front davit. The PRR, sailing in more open waters, retained the original anchors. You may want to use a sanding stick (aka nail file) to sand the deck. I see that some decks were covered with tar, so they were rough. This is a good time to paint the hull. I used Floquil’s ATSF Blue for the ATSF versions, which might not be available now. The main deck can be either the same color or a medium gray. I used PRR Tuscan, with about 25% bright red mixed in, for the PRR version, with a medium gray deck. I used White Ensign Models US Navy WWII #20 Standard Deck Gray (WEMCC US02). Rustoleum Dark Gray 2X spray cans are nearly an exact match. Carefully sand the bottom of the front house to eliminate any casting excess. Carefully sand the top of the casting so that the roof is square side-to-side to the bottom. The main house castings have clear markings for portholes, and need no further work. On the 02 deck, the portholes need to be drilled out. What size drill is your choice. Here you need to decide on a porthole treatment. I have two treatments. 1. Drill a 5/64″ hole and install 1/16″ micro-grommets. They will fit flush on the 01 deck and may stick out on the 02 deck. 2. Paint the holes glossy black. The smaller size wire can be cut to length and installed as gooseneck lighting fixtures. Drill a 5/32″ hole on the 02 deck, centered, close to the rear edge for the mast. The mast has a 3-5 degree rearward slant, so tilt the drill a bit. It is not critical, as you can always wiggle the mast a bit until it looks right. 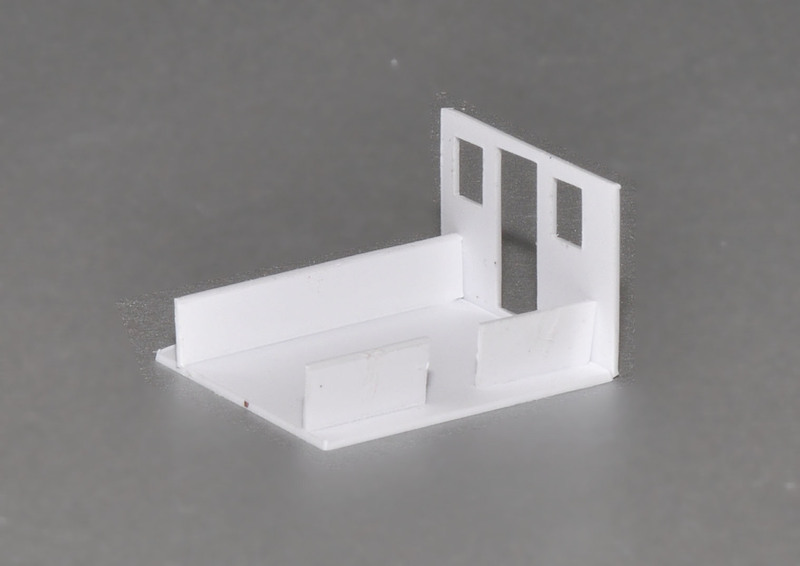 The pilot house has twelve styrene parts, plus a strip of acetate for windows. The base, desk level, and inner roof have the same dimensions. The outer roof and roof cap are progressively larger. The sunshade’s inner part should not be discarded. The pilot house sides are not square. Make sure you have them in the correct orientation for the forward sweep of the deck. I glue one side to the floor, then reinforce it with the 5.5 strip, cut into lengths. Here I’ve braced it for two open doors. Glue the second side to the floor and reinforce as you see fit. It doesn’t take much. Here I’ve glued the desk level to the reinforcement strips and walls, and added the rear wall. I decided to leave the rear closed. and trimmed the desk at only the starboard door opening. Apply acetate if desired, paint the interior, and add details. Don’t be afraid to use a sanding stick to make sure parts do not protrude. 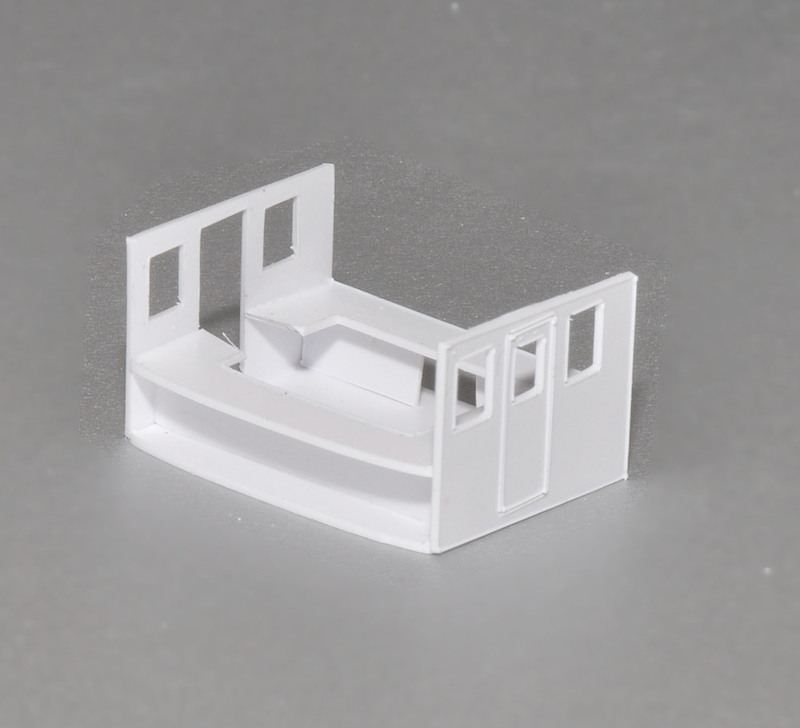 The parts are cut with precision, but alignment can get off by small amounts in any non-square structure. Laminate the inner roof to the outer roof. There is a 0.5 mm difference along the back and sides, and a 1.0 mm difference along the curved front. Glue the roof to the pilot house. Glue the sunshade to the roof, aligning on the back edge. Glue the top roof to the sunshade, aligning on the back edge. Fit the long front joiner to the assembly, making sure the windows align. There shouldn’t be much trimming here, but a few swipes of a sanding stick along the top might be needed. Glue the front joiner to the assembly. It’s kind of weird looking, but should fit perfectly. Join the pilot house assembly to the front house, making sure the pieces are aligned in all directions. Glue the bridge wing floors under the doors of the pilot house, atop the front house casting. They align with the rear edge of the wings of the main house. Follow the same procedures as the front house, adding details as desired. Measure back 60 mm (2.362″) from the point of the bow. This is where the front of the main house is located. On the port side, just clear of where the house will sit, and slightly in from the where the curve meets the front, drill a shallow 1/16″ hole for the anchor davit. Trim the two cast resin stairways if needed. Align one side so that its outside bottom edge is flush with the main house, and its top is flush with the top of the house. The top edge of the stairs should be on the centerline; if not, trim as needed. Apply the other side stairway. The rear main house butts against the stairs. Making sure it is centered, attach it to the hull. The remainder is locating and addicting details. Attach the fairleads between the pilot house and 01 deck, covering the joints with filler. Assemble the stairs. There are 13 steps and two vertical posts per stairway. Bend the railings up 90 degrees where the stair treads join the risers. Holding the stairway in one hand at about a 60 degree angle from vertical, use a sharp-pointed tweezers to slide between treads and snap each one into location. Don’t try bending the treads–once you got the tweezers positioned, a quick snap will bend them into a surprisingly uniform position. I wrap the top of the stack with a 12 mm wide strip of ordinary white paper in several thicknesses. The stack boot fits tightly. 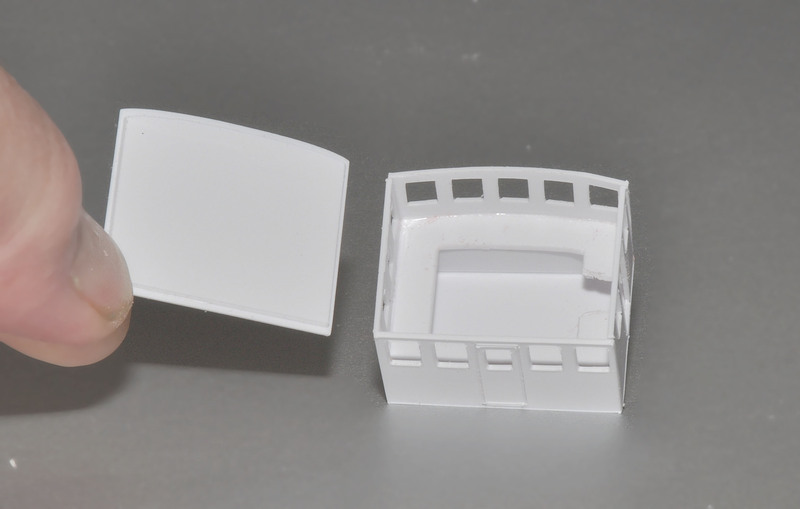 The skylight comes with both a cast piece and a cover of styrene. 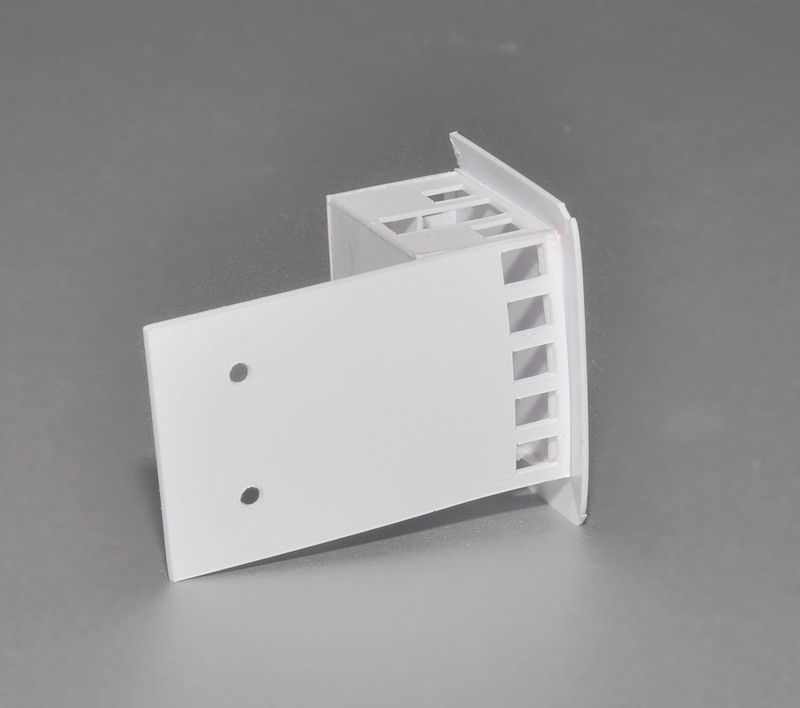 This allows you to paint the opening black without worrying too much about sharp lines–the cover provides those. Windlasses, winch, davits and bits are located on the plan. 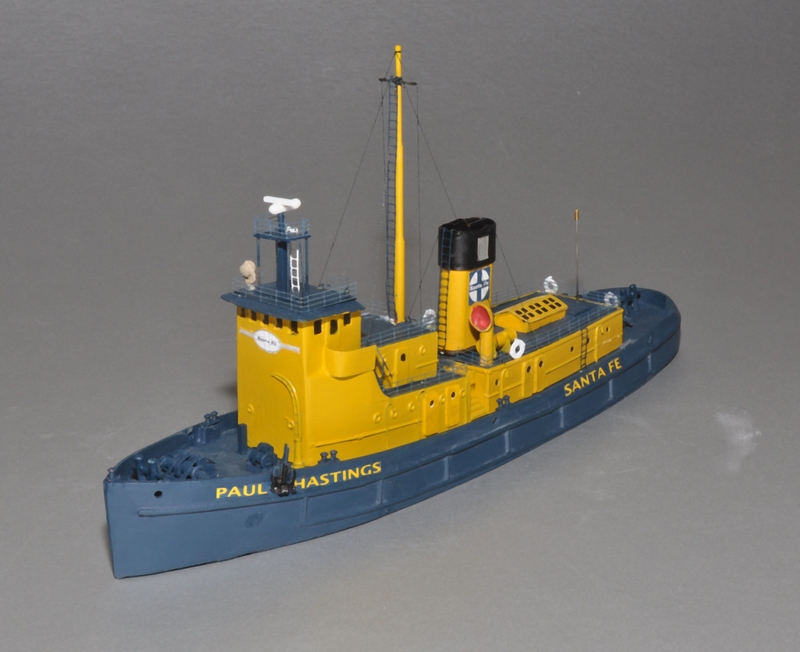 Refer to photos of the model for placement of ladders, the searchlight, the front radar platform, and mast and stack rigging.